This piece is a fun Halloween story with scary harp effects. The harpist can read the story and perform the harp effects alone but the piece can also be performed by a harpist and separate reader. There are no lever/pedal changes in this piece but all the levers/pedals are preset to C Major with all the A's lowered to Ab and all the G's raised to G# creating very eerie chord choices. There are also many special harp effects such as scraping the fingernail up a low harp string, rubbing a screwdriver along a low harp string, and many more to bring this spooky story to life. 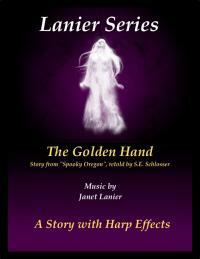 The story is about a greedy man who finds out a widow has a fake golden hand. After he convinces her to marry him, he follows through with his evil plot to murder her with a slow poison. After he buries his dead wife and places her golden hand under his pillow, she returns as a ghost and seeks her revenge on him. I performed this piece over the radio around Halloween for our local radio station KDNK in Carbondale. Please enjoy and don't get too scared! This is a good example of what the score looks like. Don't let the key signature "scare" you. All the levers/pedals are preset to C Major with all the A's lowered to Ab and all the G's raised to G#.